With that new punchy trumpet sound on my organ I more prominently miss any drums for pop music making. I am now underway implementing my dreams of a miniature bass drum. There is some little space available inside the cabinet, beside and top of the reservoir, but nowhere like as big as a conventional bass drum. Inspired from the African 'djembe' drum my focus is on a membrane driving a Helmholtz resonator. In its fundamental mode this is precisely the same kind of device as a bass reflex loudspeaker. In available space I can put a box 360*360*150 mm (14*14*6 in), about 14 liters internal volume. The Helmholtz resonance frequency formula is F = c*sqrt(S/LV)/2pi, where S is port area, L is port length, and V is cavity volume. Using that, with a 'port tube' length of L=600 mm (24 in) and a frequency F=50 Hz (arbitrary selections) the required port area is about S=0.8 dm^2 (12 in^2). This is OK for space, but only the easy part of the design problem. #1. The speaker element and the box resonance frequencies are to be about the same. #2. The box volume and the 'equivalent volume of the speaker suspension' are to be about the same. Item #2 is a bit complex and has to do with the impedance matching between driver and filter. To loudspeaker freaks this concept is conveyed by the Thiele-Small parameter Vas. The driver (loudspeaker element/membrane) has a mechanical compliance Cm (meter/Newton). This is converted into an acoustical compliance Ca = Cm*S2 (meter5/Newton), where S is the membrane area. Finally you can derive the desired parameter from the elementary formula for the acoustic compliance of a volume Ca = Vas /(rho*c2), where c=343 m/s is speed of sound and rho=1.2 kg/m3 is density of air. To say the same thing in words alone: When you exert a certain air pressure rise on the membrane, then it will yield somewhat and allow for a certain small volume displacement (distance yielded, times area). Similarly, when you put pressure on a closed cavity, then its internal air is condensed and will allow an additional volume of air to enter. Vas is the cavity volume required to accept the same displacement volume as the membrane, when you put the same pressure rise to the two. Just by intuition I made a 'membrane' covering the 360 mm square end of the box from 4 mm birch plywood. Then measured its mechanical compliance to find that it was depressed by 0.5 mm when loaded by a weight of 2 kg at its middle. About 0.0005 meter and 20 Newton, resulting in Cm=1/40000 m/N. Assuming an effective membrane area to be 6 dm2 (0.6*total area - membrane bulges much in its middle, but less toward its edges) results in Vas = 13 liter. Yipee! - good luck to be just right from the beginning! Then, to satisfy rule #1 the membrane must be tuned to the same 50 Hz. Using the basic mass-spring resonance formula (2*pi*F)2*Mm*Cm=1 tells that I should load the membrane at its middle with a mass Mm=0.4 kg. Implemented that with a couple of 120 mm dia. wooden disks, a few washers and a bolt. Final thing is to equip the beater hammer with an adequately soft stud. Beyond this optimization of the drum sounding body comes the question of its excitation. Weight, arm length, and throw for the beater, its energy and response delay time. I have so far made a beater mechanism console that holds two replicas of my harp beaters, acting near the edge of the drum. Between those is a bigger motor (100 mm long by 160 mm wide) to hit the middle of the membrane, with 'inverted' control. I.e. the hammer is held away from the drum by the pressurized motor pneumatic, and the active stroke is given by a spring when the pneumatic is evacuated by a wide aperture valve. My preliminary tests tell me that plywood 'drumskin' does not sound quite as I would like, so I just visited a special drummer's shop nearby to get me a 12" drumskin with spanner ring and a tiny 8" splash cymbal for further experimentation. Now, after several weeks I find all parts are there to the extent I can make live tests. First a few pictures of what the drum machine looks like. This is various parts of the drum at the time I glued the seating ring for the drumskin from two layers of 4 mm birch plywood. The ring rests in a circular cutout in its baffle, lying on top of the square resonator box. Each layer ring is made from two strips plus a 30 deg. wedge such that I could expand each ring tightly against the baffle hole. 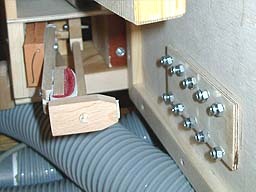 The clamps hold the ends of the strips in shape. The box has a hole in its back (obscured by the clamps with handles extending SouthWest). That hole connects to the port - the long, waisted pipe at top left. It seems I am becoming an expert in gluing curved plywood parts. Next picture shows the whole thing in place in the organ, left of the reservoir, with the port tube resting on top of it. 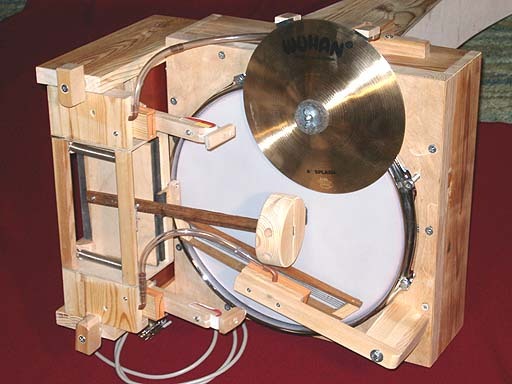 The bass drum hammer hits the center of the drumskin and is simply two wood blocks screwed together, with felt and leather wrapped on one of them to form a pad. 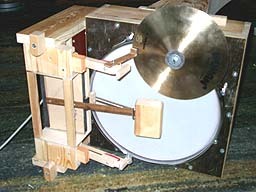 Here is the assembled device outside, with also the little cymbal mounted. The beater pneumatics all sit on an incredibly complicated shelf, one that was initially a simple plank, later sawed apart and staggered. 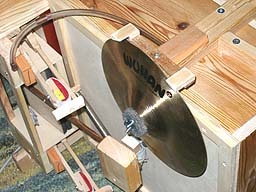 This shelf, as well as the cymbal can be easily removed without tools, they are held by eccentric wooden handles - those for the beater shelf are at left, top and bottom. The cymbal came out louder that I expected. From its beater backcheck there extends an arm toward the cymbal with a felt damper pad. This damper is not efficient enough. It seems I should use two damper pads, 90 deg apart on the cymbal circumference. Now the latest rebuild, and with the plywood membrane installed. The cymbal is damped by two pads pressed radially against its edge. 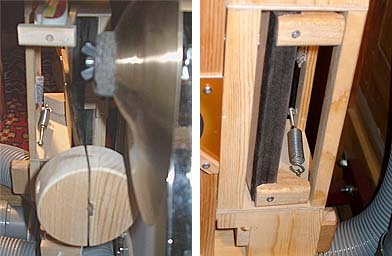 When the hammer mechanism is actuated the same air pulse goes by the plastic tube into a small pneumatic, mounted on the cymbal holder arm (top right), which lifts the dampers. Below the cymbal hammer you see a coil spring that pulls the bass drum hammer. The spring arrangement for that hammer is actually the most difficult one to implement. Ideally it should be some kind of a compass or torsion spring, with a center of rotation coinciding with the pneumatic hinge. No space available for that. I don't think the present solution is ideal, but it is simple and it works. A rear view showing the valve unit. The air intake and three Reisner chest magnets reside on a removable 'control board', screwed to the left side of the valves. The big brown seat for the bass drum valve is cut out from a scrapped hard disk. The pneumatic shelf is screwed to the right side of the valve unit. These three units can be pulled out together when I release the locking handles, one visible at top right. Experiences so far are mixed. Bass drum: The original plywood 'drumskin' with dimensioning for a bass reflex speaker made a reasonably clear 'bump', but not loud enough to me, and rather tonal. The genuine drumskin gives a louder 'sock' sounding more genuine to me. I begin to think bringing in the bass reflex principle might be a mistake. Hammer weight is about 100 grams, causing a delay of about 100 ms from electrical signal to beat. Must be compensated for in the musical arrangement. - How late do we play tonight? - One quarter beat after the drummer! It is important the drive signal should be of correct duration, about those 100 ms. If too short the beat is weakened, perhaps a useful feature. If too long, the hammer bounces to give multiple beats of dereasing force - the energy transfer from hammer to drumskin is pretty inefficient. Later I thinned the plywood membrane to about 2.7 mm (two plies left of original three) to make it more compliant at its edge, while the about 100 mm dia. center portion was untouched. This was quite successful to bring bass drum action right. Compliance about doubled, so I removed half the ballast weight at its middle and got some more response in sound level. Small drum beats are very 'hard', but may be moderated putting a softening leather pad on the hammer. Here are spectra and sound clips for the bass drum (center hammer) and the small drum (bottom hammer, near the edge). The two alternatives using a regular 12" drumskin and the thinned plywood membrane. The final sample is very hard and bright, the hammer is plain hardwood, with no leather pad. Small drum (lower beater): So far not quite in order. Sounds most like a wood block with the plywood membrane, and is too meek with the drumskin. With the drumskin perhaps I could glue on a hard little pallet where the beater hits. Or a flat box with hails in it to simulate a snare. I tried various ways to shape the small drum sound. With a hard wood beater on the plywood it is too distinct and brutal (sample above), with a leather pad (like in this picture) on the beater it makes somewhat more sense. Since it would probably be good trying to mimick a snare drum I tried a few variations on the rattle theme. The picture shows one of them. A little 40*100 mm plywood bridge with a number of plate screws into it. Each screw holds an oversize nut, but loosely, so it is free to rattle. The bridge is glued with two intervening thin felt pads to the plywood 'drumskin'. The hammer beat is additionally softened by these (invisible) felt pads. A drawback is that they rattle also with the bass drum beats, but I don't think this is disturbing in practice. - Against better knowledge I also tried a 'jingle bell' on the hammer head, a small sheet metal container with loose nuts inside. Complete failure: this comes out like a bounce free hammer that does not rebound to the backcheck, so repetition rate was severely hampered. 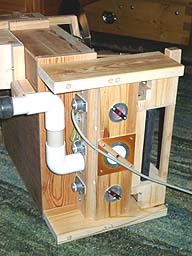 04-02-04: Following principles suggested by Zeb Vance, I improved the bass hammer spring system. Two adjustable springs, one each end of the pneumatic, pull yokes near the hinge of the moving leaf. There are heels on these yokes going down to cover the pneumatic hinge over both its leaves. These heels unload the hinge from the rather substantial spring force that would otherwise tend to skew and tear off the motor cloth, glued to the leaf edges. I also made a somewhat more agreeable bass beater hammer head, 80 grams. Its shaft is a fairly springy hardwood rib. When the motor collapses this shaft is halted by an adjustable bracket (barely visible below the gray felt pad holding the cymbal) when the hammer is some 10 mm away from the drumhead. The shaft is rigidly bolted to the driver leaf, still probably a good deal more elastic than necessary. Here the 'real' drumhead is reinstalled, I believe this is the one I will keep, for authenticity and for looks. Final solution approaching. 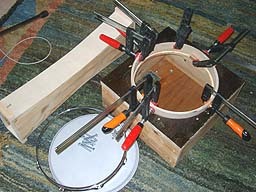 A light frame holds four thin coil springs across the drumhead. The middle of the frame is hinged to a small preumatic, fixed on an arm to hold all in place, extending from low right in the picture. 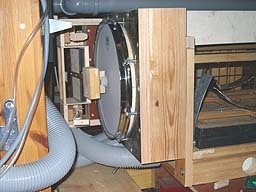 The snare frame is pressed against the drumhead in synchrony with the drum beater pneumatic. When deactivated the frame is lifted off a few millimeters by a staple return spring at its pneumatic hinge. A detail refinement is at the tube connection next to the beater pneumatic. This makes for no snare action with the bass drum, unless the 'small' drum goes simultaneously. There is an extra little snare noise coming from the frame being smashed into the drumhead. Only snag is that its sound level is still on the weak side, perhaps the motor should have been bigger. Maybe one could do with two beaters in order to double repetition rate from the present max about 8/sec. Here the cymbal is equipped with a damper, two felt clad pegs at its top rim. These were later joined by a felted curved bridge to improve damping. The damper is lifted by a small pneumatic, connected by a tube in parallel to the beater driver pneumatic. - The duration of the cymbal 'note' signal is significant. With a short one (50 ms) you get something like a closed high hat beat. With a longer one there is a range up to more like a splash cymbal.